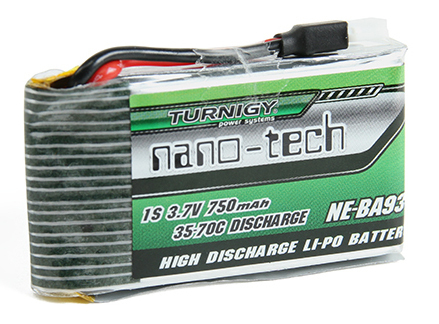 Plantraco / Full River 20mAh Bahoma Lithium Polymer Cell. Weight is 0.96 grams and dimensions 17mm x 11mm x 3.5mm. This 20C 20 mAh cell can put out up to 400mA. Should be charged at no more than 40mA on the Bicha charger or a 1S charger using a suitable Bahoma adapter. 40mAh Lithium Polymer cell with 50mm wires, weighs 1.2g. 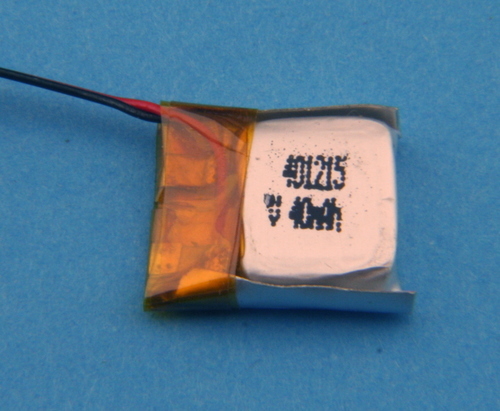 A single cell 50mAh 'UM' LiPo, as used on ARES micro models. 110mAh Lithium Polymer cell with bare tabs, weighs 3gm. A 270mAh single cell LiPo with cylindrical form factor, ideal for fitting into long, thin spaces (e.g. model railway wagon or carriage). Discharge up to 15C (4A) and charge up to 5C (1.35A). 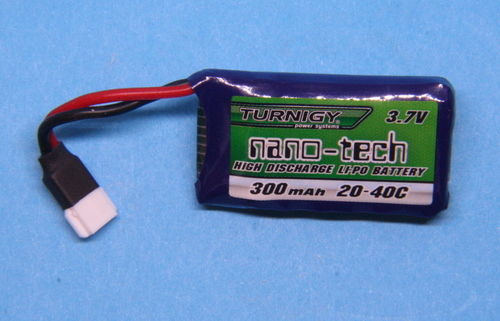 A 300mAh 20C single cell LiPo with small form factor and a high discharge rate. Molex 2mm connector with pin 1 negative. A 500mAh 35C single cell LiPo with small form factor and a high discharge rate. A 500mAh single cell LiPo with small form factor and internal 2.5A resettable fuse. A 600mAh 65C single cell LiPo with small form factor and a high discharge rate. A 600mAh 25C single cell LiPo with small form factor and a high discharge rate. A 750mAh 35C single cell LiPo with small form factor and a high discharge rate. 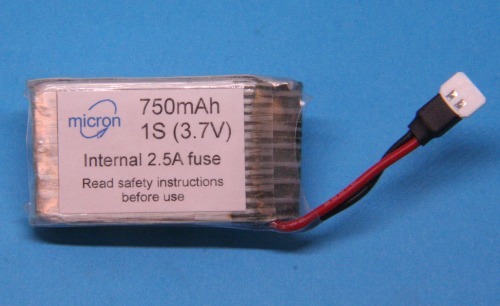 A 750mAh single cell LiPo with small form factor and internal 2.5A resettable fuse. Fitted with a 2 pin Molex 2mm plug with pin 1 negative.